Christine's interests, distinctive skills and leadership, both national and international, lie in three aspects of business and society intersection  in research, teaching and management  all focused on critical emerging issues such as sustainability, health, obesity and ocean literacy. 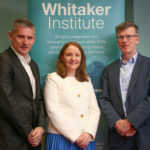 Christine is also the Research Leader for SIPPs, Social Innovation Participation and Policy unit within the Whitaker Institute, NUI Galway, investigating Systems-thinking Social Marketing for Change and Social Innovation through a multi-disciplinary lens with partners in the UK, Europe, USA and Canada. Her current funded EU and national research work embraces H2020 SOPHIE, EEA PA SHEER Well-Being, H2020 Sea Change, EPA/HSE Near Health and IRC Operation Transformation. Christine iis directly responsible for and have actively secured competitive peer-reviewed funding of 4.23 million from national and international bodies for SIPPs research. In direct, hands-on management of intersecting social and business systems Christine worked to design, establish, fund and manage (3.1 million secured) the National Childrens Discovery Museum in Galway.